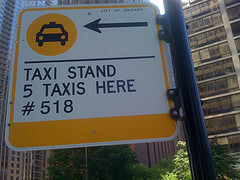 Chicago Dispatcher reports that the City of Chicago has auctioned another 50 taxi medallions. Ten of these were reserved for working cabbies and went for $150,599 to $180,101. Of the remaining 40, half were bought by Paul Widmarck for $259,999 each, and the other half by Leonid Sorkin for prices ranging from $252,800 to $254,700. I assume that the total proceeds, something under $12 million, will be used to help plug the City’s current budget deficit. I suppose that’s better than giving medallions away, but a policy of collecting annually the rental value of a medallion would provide a continuing income stream to the City and prevent speculation. The ten owner-operator medallions “are designated, and must remain, Owner/Operator Medallions.” It will be interesting to see how this is enforced over the years. The speculative prices over $250,000 compare to past sales which, to my knowledge, have never exceeded $200,000. Shortly before the sale, Chicago Dispatcher provided a graph of medallion price trends. Certainly looks like a speculative bubble to me. But you probably should ignore me. Had I had been prescient enough to know what would happen to medallion prices, I would have bought a couple dozen (on credit) five years ago. (Chicago Dispatcher data are for the period ending on the 23rd of the indicated month). I find it remarkable that this kind of real estate has continued to gain value, over 7% in 3 months, while most other kinds in Chicago seem to have declined. There was, however, considerable fluctuation recently, with sales in late April running around $145,000, increasing to $175,000 on May 19 and 20. According to ads in the Dispatcher, you can lease your medallion out for $600 to $700 per month, a yield of close to 5% (in addition to any price appreciation which might occur). There is, of course, some risk that the price might depreciate instead.